Located in the prestigious 1st district of Paris, between Place de la Concorde and the Louvre Museum, the Melia Vendome Boutique Hotel offers stylish en suite rooms just 500 metres from the Champs Elysees. This boutique hotel is decorated with marble floors and antique tapestries. The spacious guest rooms are equipped with air conditioning, satellite TV, a minibar and wired internet access. Melia Vendome Boutique Hotel serves a daily buffet breakfast. 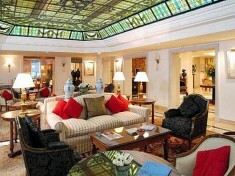 In the evening, guests may also enjoy a drink in the hotel's lounge bar. The hotel's front desk is open 24 hours a day and a concierge service is available. Melia Vendome also provides a laundry service and airport shuttle upon request. The closest Metro Station is Concorde, which provides a direct link to the Saint-Germain-des-Pres and Montmartre districts of the city. Les Jardins des Tuileries are 100 metres from the hotel and the Louvre is 1 km away. 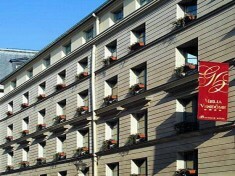 The MELIA VENDOME BOUTIQUE is a Tourist hotel. Located in City Centre - Place Concorde area. Shopping is accessible by bus/taxi and the nightlife/restaurants are easily accessible by taxi or bus from the hotel. Descriptionclass="small" style="text-align: justify; font-size:11px;">Located in the prestigious 1st district of Paris, between Place de la Concorde and the Louvre Museum, the Melia Vendome Boutique Hotel offers stylish en suite rooms just 500 metres from the Champs Elysees. This boutique hotel is decorated with marble floors and antique tapestries. 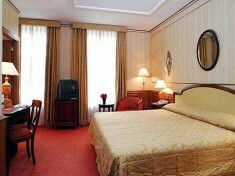 The spacious guest rooms are equipped with air conditioning, satellite TV, a minibar and wired internet access. Melia Vendome Boutique Hotel serves a daily buffet breakfast. 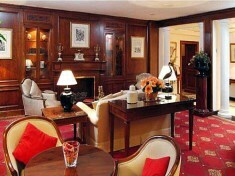 In the evening, guests may also enjoy a drink in the hotel's lounge bar. The hotel's front desk is open 24 hours a day and a concierge service is available. Melia Vendome also provides a laundry service and airport shuttle upon request. The closest Metro Station is Concorde, which provides a direct link to the Saint-Germain-des-Pres and Montmartre districts of the city. Les Jardins des Tuileries are 100 metres from the hotel and the Louvre is 1 km away.